One of the advantages of Mr. Spice working near me is that theoretically we can carpool to work. I say theoretically because we talk about carpooling more than actually doing it. Another good thing about him working nearby is that we can meet up for lunch dates during the week when we’re both free. A couple weeks ago, we both found ourselves working on a Saturday. I was getting to that point where I needed more and more “sanity” lunch breaks to get away from my office, so Mr. Spice suggested we try out a new hot dog place that opened up across the street from his office. He’d already been once that week and was eager to go again. 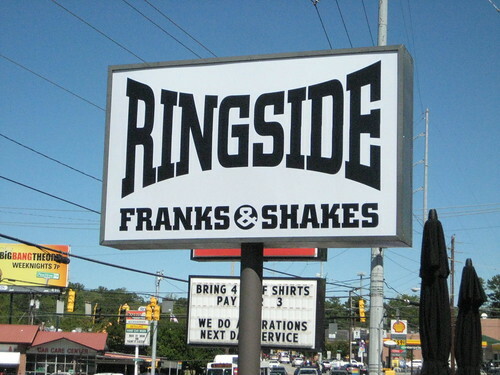 Ringside Franks & Shakes opened up in a former frozen-yogurt shop a few weeks ago and seems to be taking off in popularity. 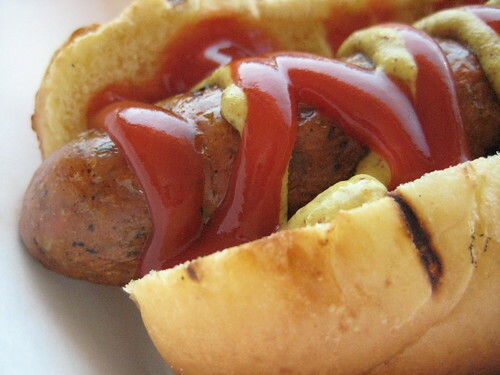 They serve franks, sausages, and brats (all locally sourced) on freshly made rolls, along with hand-cut fries and milkshakes. Sounds good, right? Just wait until you taste it. 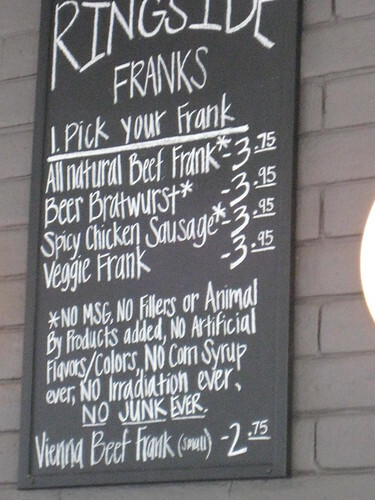 I debated a while between getting a beef frank or the spicy chicken sausage. The chicken sausage won out this time, after I informed Mr. Spice I would be taking a bite of his hot dog for research purposes. 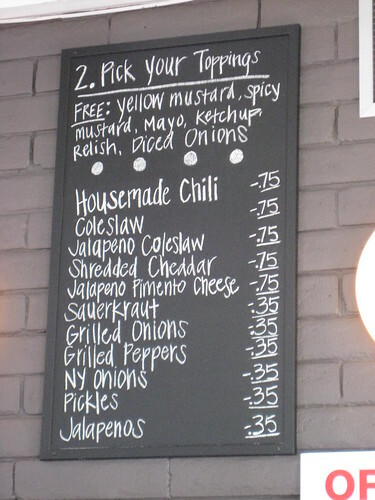 I got the chicken sausage with ketchup and spicy mustard, while Mr. Spice topped his beef hot dog with chili, onions, and jalapenos. 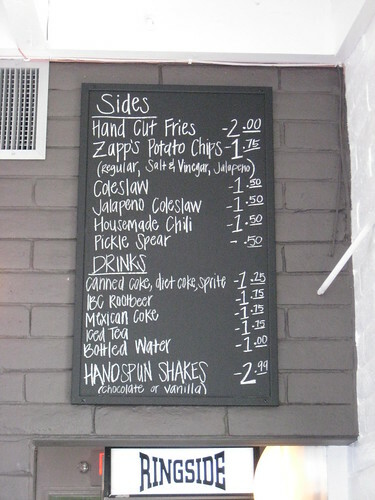 We split some fries and got some soft drinks. 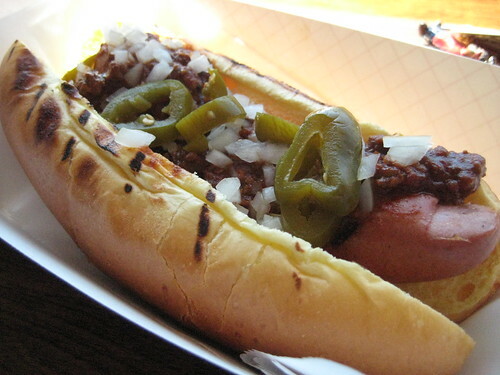 These are some damn good hot dogs. 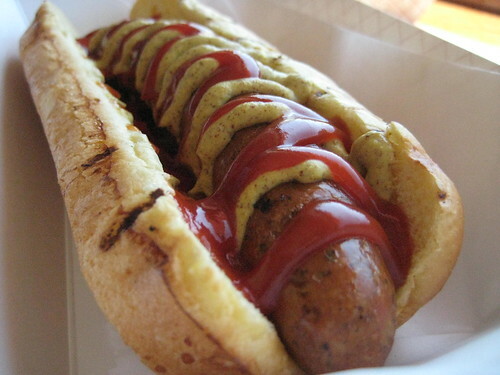 The spicy chicken sausage had some zing and reminded me of the chicken andouille sausages I like to get at Costco. 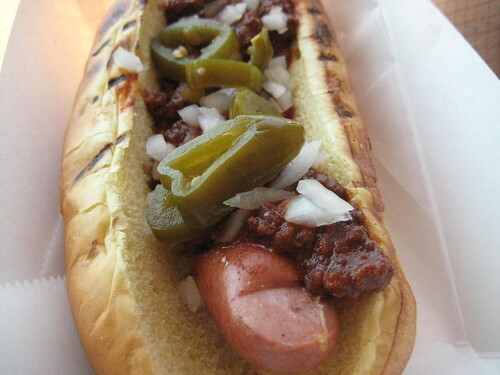 The beef frank was really good too, and the chili on top didn’t taste like that cheap stuff you sometimes get on hotdogs. 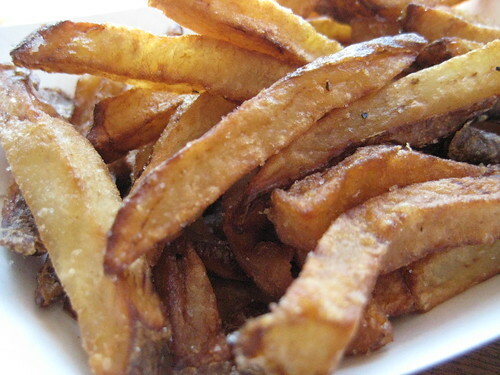 And let’s not forget about the fries! I lurve me some fries. These had a slightly sweet taste to them that I actually didn’t mind. And there were plenty of the soft squishy fries that I like. Good thing it’s close to our offices, there will most definitely be a next time! those look so good! nick would love that place. If you’re ever in town again we’ll have to hit it up. Previous post: Pumpkin Chai Spice Coffee + Godiva Coffee Coupon!